In a major reassessment of modern conservatism, noted historian Kathryn S. Olmsted reexamines the explosive labor disputes in the agricultural fields of Depression-era California, the cauldron that inspired a generation of artists and writers and that triggered the intervention of FDR's New Deal. 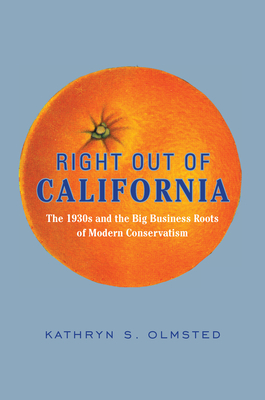 Right Out of California tells how this brief moment of upheaval terrified business leaders into rethinking their relationship to American politics--a narrative that pits a ruthless generation of growers against a passionate cast of reformers, writers, and revolutionaries. Olmsted reveals how California's businessmen learned the language of populism with the help of allies in the media and entertainment industries, and in the process created a new style of politics: corporate funding of grassroots groups, military-style intelligence gathering against political enemies, professional campaign consultants, and alliances between religious and economic conservatives. The business leaders who battled for the hearts and minds of Depression-era California, moreover, would go on to create the organizations that launched the careers of Richard Nixon and Ronald Reagan. A riveting history in its own right, Right Out of California is also a vital chapter in our nation's political transformation whose echoes are still felt today. Kathryn Olmsted is chair of the history department at the University of California, Davis. A noted historian of anticommunism, she is the author of several books, including "Challenging the Secret Government," "Red Spy Queen," and "Real Enemies." She lives in Davis, California.